So here we are, the last day of the season, and what a last day it could prove to be. On a local squabbling level, we could still nab fourth place, and with it a guaranteed spot in the Champions League, from our loving chums up the road. On another level, it’s definitely the last league appearance for one of our finest ever players – and hell, for all we know it could be the last home appearance of several other big players from our present. Most of all, it’s a big goodbye to our home of 93 years, Arsenal Stadium, Highbury. Reading one of the many tributes yesterday made me realise [even more than I already did] what an influence the old place has had on a hell of a lot of people. It’s more than just a crumbling old stadium, that’s the trouble – it’s a place where most of us fell in love with the Arsenal, a place where unimaginable highs have been peppered with hideous lows, a place, in short, to get away from all the other stuff happening in the real world. It’s been a home away from home. Like a mangled old pair of slippers, it’s a comforting heirloom. It’s a cliché, but the first game is always one for the brain scrapbook. 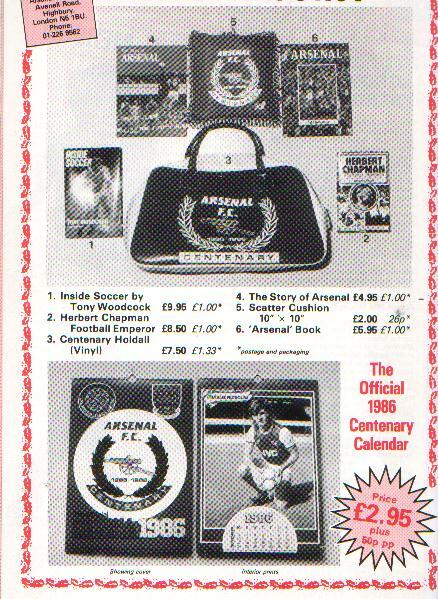 This was mine, and I sat in the West Upper, next to the Clock End, with my old man and my brother. The team was as follows; Lukic, Anderson, Sansom, Davis, O’Leary, Keown, Allinson, Robson, Nicholas, Quinn and Rix, with Hayes on the bench (just one! – five now – that’s inflation for you). The programme cost 50p, there were precisely 35,048 there, and we won 2-0 with a goal from Niall Quinn on his debut and one from Charlie Nicholas. I remember bits of it like it was yesterday, but in truth, most of it has been consigned to the brain bin, along with pretty much everything else from 21 years ago. I do however remember it was brilliant, and I wanted to go again, urgently. I was on holiday up on the coast of Lincolnshire, and as a treat my mum let me and my cousin get a coach down to London for the opening day of the season. We were there early, and it was a good job, because by about 1.30pm it was clear this was going to be a humdinger of a crowd. We’d just won the League Cup, Liverpool were the team to beat, and it was sweltering hot. The north bank was rammed and the noise was electric. The game itself was a decent one, Liverpool taking the lead before Davis equalised, with Nicol sealing the win for the visitors with an improbably good header from what seemed like about 30 yards. But for me, the memory was the crowd – I’d never been to a Highbury so full – there wasn’t an inch to spare, and there were even fans on the roof of the north bank. As it turns out, I’ve not been to a bigger crowd since at Highbury – though that will of course change next season. Oddly enough, Alan Smith [that day making his debut], recalls that day here. The fact that a pube-topped Danish defensive midfielder hadn’t scored for us shouldn’t have been cause for celebration, but we were having a crap league season – a really crap league season – and his cause took on cult status. Let’s face it, the player who scored so spectacularly in the final of the European Championships couldn’t hit a barn door for Arsenal, and so it was that 98 games passed and he still hadn’t netted. So when it finally came, levelling the game at 1-1, the crowd went so spare it was as if we’d won the pools and the European Cup at the same time. Of course, it helped that the goal was a peach too, curling in from outside the box [or at least that’s how I remember it]. And to prove we were having a bad year, we did of course go on to lose 3-1. PS – John Jensen has his own Wikipedia page.